Can I share my Questions / Question Sets with other teachers? 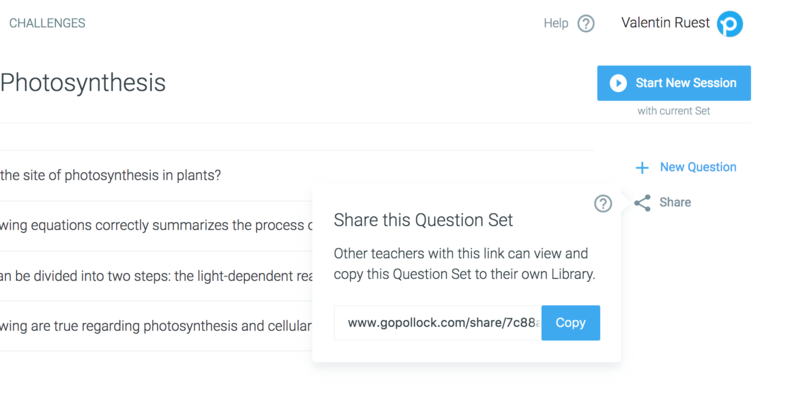 Questions Sets can be shared with other teachers with a unique private link. In your Library, either check a Question Set or open a specific Question Set to see the "Share" button on your right-hand side menu. Click on it to open a little popup with your share link. You can click on Copy and paste the link wherever you want. Important: by default, all Question Sets you have create are only visible to you. However, be aware that when you share your unique Question Set link, other users will now be able to access them as well. So please be careful who you share it with. It's very simple: anyone who opens your unique share link can now look into all questions, including descriptions, images, and answers. If the other user likes it, they can simply add it to their Library by clicking on "Add to my Library". They can now use your Question Set in their own Session! Try it now: Open example Share Link! By the way: once another user adds your Question Set to their Library, a copy is created. So if you edit it later, or even delete it in your Library, it will not affect existing copies in other user's Library. If they want your updates, they would need to re-use the share link and add an updated copy again.